Evelyn is a Texas native who lives in Southern Maine with her husband and two Piney kids. This cowgirl loves adventuring outdoors with her family (looking under rocks for critters), singing, and artistic dabbling. As a kid, the Texas heat left her craving the cool air of the Rocky mountains so she ventured to the wild blue yonder of the Air Force Academy. There she played soccer, ran the foothills, and was trained as a military officer- in addition to learning survival and evasion skills. After graduation she was stationed in the beautiful green islands of the Azores where she enjoyed exploring the marine life, dramatic landscapes, and self-sufficient fishing villages. 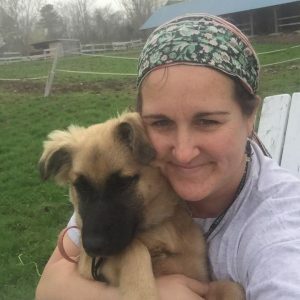 Post military life, she spent several years working at UNH with researchers focusing on better understanding the impacts of climate change and land development on the environment. She was inspired by the outreach component of that work and colleagues who were working to connect kids to science. While she does enjoy a good camouflage, she is discovering a budding passion for connecting youth with nature. Join Evelyn as a supporter of White Pine Programs today!